Don Taylor, the creator of garrityrights.org, has many years of experience representing and training employees in both the public and private sectors. He has taught university and graduate school courses in labor studies and public administration, and is a certified professional trainer. He teaches Garrity Rights and other labor relations topics in multi-day training programs, half-day workshops, and 60-90 minute presentations. Programs are customized for each organization. 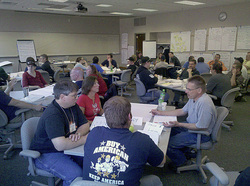 Employees, labor unions, and employers have all benefited from his clear presentation style and participatory training methods. He is also available to consult with organizations who need to undertake strategic planning, organizational change, and campaign development. Whatever your training or consulting needs might be, Contact Prof. Taylor to discuss how he can be of help to you.